In order to work the transistor as a current sink the transistor should be operated in linear region. 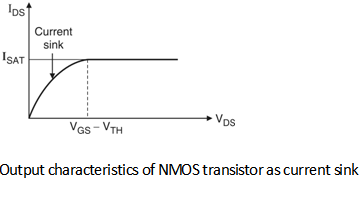 Figure below shows the output characteristics of the NMOS transistor with showing the current sink region. From Figure, it can be seen that, if VDS is less than the gate overdrive voltage i.e. (VGS â€“ VTH) then the transistor work as a current sink. Figure shows the current sink circuit based on NMOS transistor. The condition to operate the transistor as a current sink is that, the voltage VB should be applied with fixed biasing voltage and the drain voltage applied to the transistor should be less than the gate overdrive voltage (VGS â€“ VTH).